I’ll be the first to admit that I haven’t always appreciated good art. The lowest grade I ever received in school was in art. I’m not very creative nor adept in the world of art. Art also wasn’t taught in a way to make me really appreciate the beauty of the world and how it manifests itself in the creativity of the artist. I’ve been growing and expanding in appreciating art that is a reflection of the reality of the world and gives expression to the longings of our hearts. My former college philosophy professor posted “Sorrowing Old Man (At Eternity’s Gate)” by Vincent van Gogh (1890) on his Facebook today. The painting, shows the inner turmoil that many of us experience regarding all of the sad news we experience each day and are unable to articulate with words. Van Gogh, a troubled artist himself, captures perfectly the anguish and sorrow that people feel as they age and are closer to death. Even Christians can struggle with the knowledge of our impending end on this mortal coil. Yet, most of us struggle with an inability to communicate the deepest fears and longings in our hearts with mere words. While words are the primary means by which God has communicated to us His revelation (Jesus Himself is “The Word”), the language of God’s revelation includes the artistic beauty of the world around us. It informs us, and serves as a means for communicating what is at the center of our being, when we cannot formulate words. Art is that expression of the human soul to put into a visible form something we cannot utter in words. One of the clearest expressions of the inner turmoil of my soul over the pain and suffering of this world and yet the hope of Christ is the hauntingly beautiful “Gabriel’s Oboe” by Ennio Morricone from the movie The Mission. In the movie, a Jesuit priest is attempting to build a relationship with natives in South America. His oboe becomes the means by which the natives become interested in the priest and the message he is seeking to communicate. It is beautiful and expressive of hope and joy, and haunting in its minor tones because of the struggle and strife that end the movie (I heartily recommend the movie but be prepared to have your emotions tugged back and forth). Another piece that expresses that same struggle is “Adagio for Strings” by Samuel Barber which is the main theme of the movie Platoon. And when it comes to the general feeling of hopelessness, consider Messiaen’s “Quartet for the End of Time“, written while a German prisoner in WWII. And it need not just be modern music. Find me someone who isn’t moved by Mozart’s “Requiem Mass in D Minor“. 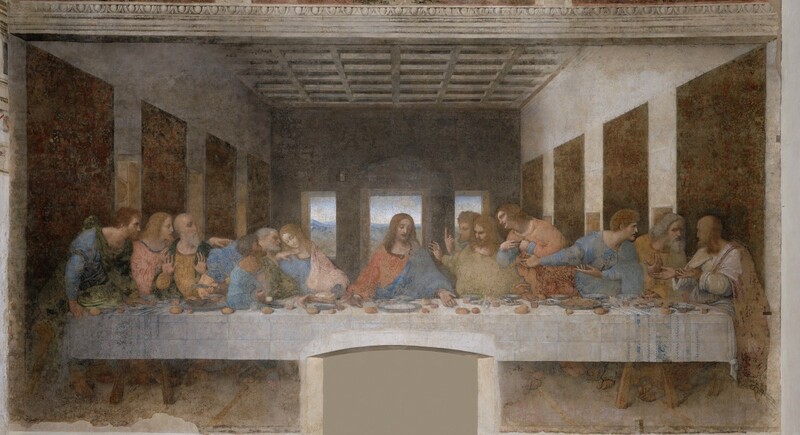 Leonardo Da Vinci’s “The Last Supper” (1495) represents that sadness on the part of our own Savior following the announcement that one of the disciples would betray Him. The look of sorrow on His face is striking. We too are the disciple that betrayed our Lord. It invokes feelings in our core that are hard to speak aloud. It is not just sadness or inner turmoil that art speaks to, but joy and rapture as well. Holst’s “Jupiter” lifts your heart and spirit as it progresses through movements of joy! What about the old fashioned sound of happiness in Copand’s “Hoe Down” from his larger “Rodeo”. Or, what is more joyous in all of music than the overture to Mozart’s “The Marriage of Figaro.” And Monet’s “The Cliff Walk at Pourville” (1882) just makes your heart feel warm. Painting, music, movies, can help to put words to the inner feelings of our soul. We are creative beings because our God is a creator. We yearn to give expression to what we feel, and what emerges is art. There is good art, and bad art, just as there is good expression of the longings of our souls, and bad expressions (on that note, everyone must watch this excellent video about beauty by my favorite modern philosopher, Roger Scruton). Christians at one time were at the forefront of art and beauty as a manifestation of the goodness of God in making us creative beings with impulses to express the vast expanse of human experience to the glory of God. More Christians should be involved in this same movement today. If we hope to see better art, we need to learn to appreciate better art, and to encourage people to use their talents to express the inexpressible to honor God and educate our souls. For a critical look at how art has tended to denigrate itself over time, see Nancy Pearcy’s excellent, Saving Leonardo. On how we as Christians should be doing art, see the classic Art and the Bible by Francis Schaeffer and Phillip Ryken’s, Art for God’s Sake. N.B. Let me start with an introductory statement: “I told you sos” are not allowed as responses. I have always been very interested in politics, government, and the news. I was raised in a home where what was going on in the world was discussed and opinions shared. Opinions could range widely, and in our home, we had, and have varying opinions. And they are held strongly, and often shared vociferously. I think rigorous and vigorous debate and discussion is good. We are called to earnestly contend for the faith (Jude 3) and that means addressing falsehood as well. Christians should be people who know the truth, love the truth, share the truth, and shun falsehood. But every man has to know his limitations. And I am constantly learning mine. My sinful struggles are with pride and arrogance. My joke often is, “they think they know everything, while I know I know everything.” It’s meant as a joke, but the Lord continues to work in me to show me it’s more of an accurate reflection of my heart attitude rather than a sarcastically amusing statement. I keep well-informed of happenings around the world. I read the paper and listen to the news daily. I read widely in philosophy, ethics, and theology. I follow current events in religion, theology, and politics. I think that it is important for pastors (and Christians) to be aware of what God is doing around the world, and for us to train our thoughts to think biblically about what we see, read, and hear. Being well-informed though, is no defense for seeking to constantly correct people or win the debate. While being a teacher means correcting false thinking, there is a humble way and a proud way to do that. More often than not, especially in the political realm but in other areas too, I’m seeing that attitude grow in me. So, for that I need to repent. I need to confess my pride and arrogance and remember God is in control and I am not. I am His servant, and a servant to His flock. I am to be boasting in the work of Christ alone and not in my knowledge or my acumen. I am not to be seeking to have the winning blow in the debate, or to police what I see on the internet. I repent of my pride and arrogance which may have caused me to defame Christ or His church by my actions. If I have sinned against anyone reading this, please accept my apology. I am going to work, by the power of the Holy Spirit to continue to battle pride and arrogance in my life. I cannot do it alone. I hope and pray you will all pray for me for success in this area of sinful weakness. If I sin in my actions or words, I hope you’ll say something. I know my limitations. My limitations are me. I am my biggest problem. At the core, I wrestle to make myself king rather than to submit myself to King Jesus. That’s really all of our problem. And the solution is more of Jesus and less of me. You are currently browsing the Working out Salvation with Fear and Trembling blog archives for July, 2016.